Festival Announces New Closing Event on August 6th with Ballet Gala: Stars of the Bolshoi and Mariinsky, presented by Max and Irina. The 8th Annual Tuscan Sun Festival launches on sale May 5th with further exciting programs, living up to its reputation as one of 'The Ten Best Summer Arts Festivals'* Featuring Joshua Bell, Maxim Beloserkovsky, DAZE, Irina Dvorovenko, Reneé Fleming, Marcello Giordani, Nina Kotova, Steven Isserlis, Gabriele Lavia, Ekaterina Scherbachenko, Sting, Trudie Styler, James Suckling and Alberto Veronesi. Husband and wife team Sting and Trudie Styler appear together on stage at the 2010 Tuscan Sun Festival in Twin Spirits: an unique and intimate live theatrical performance by a chamber ensemble of actors, singers and musicians, portraying the deep and ultimately tragic love between the composer Robert Schumann and his pianist wife Clara Wieck. In this intensely moving performance of words, song and music, the Schumanns' long separation, so formative an influence on their lives, is reflected in the division of the ensemble into male and female groups. The project brings its performers into a proximity that creates palpable emotion leaving audiences deeply touched and inspired. Conceived and produced by June Chichester, written and directed by John Caird, Twin Spirits was first performed in June 2005 at the Royal Opera House, Covent Garden, London, which was filmed and is available on DVD. Twin Spirits will be staged twice in Teatro Signorelli on August 5th and also features the renowned instrumentalists Joshua Bell and Nina Kotova. A special limited seating gala post-concert reception will be held at one of the leading Tuscan wineries, Avignonesi, one of the partner of the 2010 Tuscan Sun Festival. Proceeds from the concert and reception will be donated to the Rainforest Fund, the charity established by Sting and Trudie Styler over 20 years ago, the Del Sole Foundation, and the Royal Opera House Education Fund. Tickets for the Tuscan Sun Festival will be on sale from Wednesday, May 5th. Following their spectacular appearance at the 2009 festival, principal dancers of the American Ballet Theater, Maxim Beloserkovsky and Irina Dvorovenko (Max and Irina) return to the Festival to present a Ballet Gala: Stars of the Bolshoi and Mariinsky. Marking the new closing date for the Tuscan Sun Festival as August 6th, Max and Irina's performance, together with dancers from the renowned Bolshoi and Mariinsky Theatres, will be held under the stars in Cortona's Piazza Signorelli, and will also include two friends, Oleksandr Ryabko and Silvia Azzoni, from the prestigious Hamburg Ballet, who joined the couple during last year's Ballet Gala. With a musical programme boasting some of the world's most distinguished artists, the Festival opens with an Opera Gala, featuring the winner of the BBC Cardiff Singer of the World, Russian soprano Ekaterina Scherbachenko, together with tenor Marcello Giordani, supported by the Orchestra della Toscana. GRAMMY award-winning diva soprano, Reneé Fleming, appears in Piazza Signorelli for an evening of beautiful arias, together with the Orchestra del Festival Puccini, led by Alberto Veronesi and including the participation of the young "wunderkind" composer and conductor Anthony Arcaini. Ms. Fleming's appearance at the Festival is supported by Ferruccio Ferragamo's wine estate, Il Borro. Violin superstar Joshua Bell returns to the Festival with his long-time collaborator, Gramophone award-winning cellist Steven Isserlis, and Italian actor/director Gabriele Lavia delivers an evening of monologues called "Il Sogno di un uomo ridicolo" (The Dream of a Ridiculous Man), by Fyodor Dostoevsky, supported by harpist Cecilia Chailly. As ever, the evening musical programme is balanced with daytime events and this year's line-up is more adventurous than ever. Trudie Styler will be presenting a wellness session together with her personal trainer, former dancer and Pilates teacher James D'Silva. Together they will lead a dynamic, empowering yoga and pilates workout. During a second Festival Event on biodynamic Wine, Ms. Styler will be on a panel together with the distinguished wine critic James Suckling. Featuring Ms. Styler's own biodynamic winemaker from her Italian estate, il Pelagio, they will describe the process involved in creating biodynamic wine as well as offering a tasting of the wines for a comparative discussion. James Suckling will also lead a Wine & Cuisine event new to the 2010 Festival, "Masters of Wine". This year's event will be an exclusive tasting of Brunello Riserva 2004, followed by a Michelin-starred dinner at Il Falconiere, featuring its chef, Silvia Baracchi. These wine events are supported by Molesini, Official Wine Merchant to the Festival. Every year, the Tuscan Sun Festival is host to a visual artist. This year we are excited to present an exhibition by the New York urban artist DAZE. In addition to his exhibition, DAZE will create art works in a public space during the festival. The exhibition is a free event, and DAZE will also give an interview as part of our 'Conversation with an Artist' series, led by prominent writer/speaker, and Festival regular, Matthew Gurewitsch. 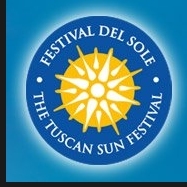 The Tuscan Sun Festival is the original within the family of Sun Festivals produced by IMG Artists. The annual Festival del Sole - Napa Valley takes place in July in California's beautiful Napa Valley and the annual Singapore Sun Festival takes place in October in locations ranging from the historical and intimate Arts House at The Old Parliament, the lush tropical setting of Spa Botanica, the picturesque promenade along the Singapore River, the stunning Esplanade - Theatres on the Bay and the alluring IndoChine Empress Place by the Waterfront. The Tuscan Sun Festival would like to thank it's 2010 partners Comune di Cortona, Provincia di Arezzo and Regione Toscana as well as AngloInfo Tuscany, Avignonesi, Banca Popolare, Il Borro, Classica TV, Consorzio Vini Cortona, Il Falconiere, Hapag-Lloyd, Maserati, Molesini and Tuscan Living Magazine. For ticket information, see www.tuscansunfestival.com.